I create corporate technical education in my daytime job (screencasts and podcasts) and recently started getting into videocasts. One of the things I struggled with was reading from a script for the audio podcasts and now that I’m doing video, it was even harder to scroll through a document while being on camera. This sent me searching for some of the the teleprompter solutions out there. Through reading several video related blogs, I ended up coming across products from Bodelin Technologies. They made teleprompters, but for more higher end video production. Recently they created a lower end product for some of the video bloggers out there. 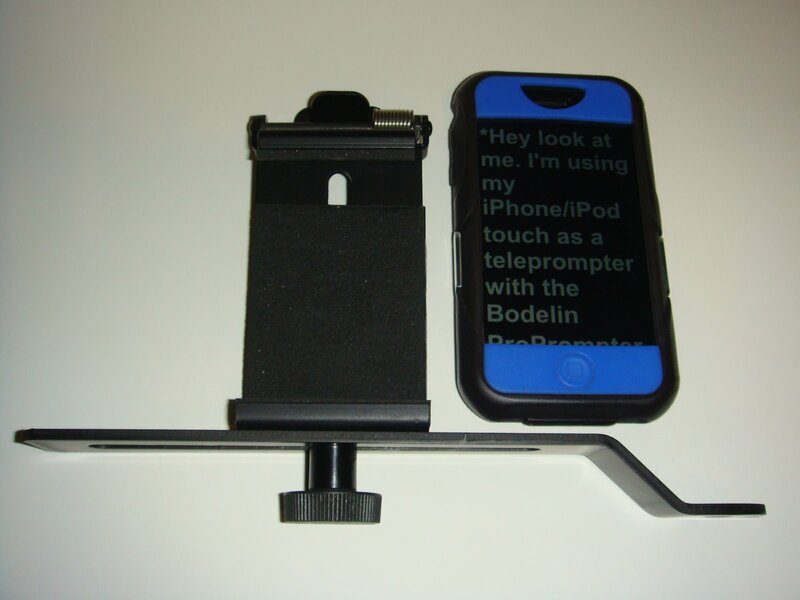 The product they created was the ProPrompter Wing and a ProPrompter iPhone/iTouch App. I recently purchased the products. 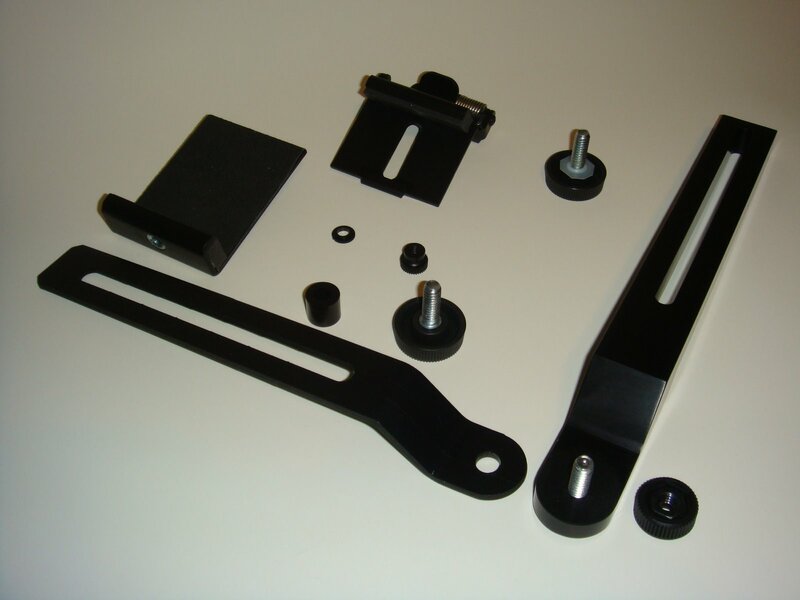 The ProPrompter Wing was $129 with another $9.06 shipping fee for a total cost of $138.06. This pricing was not the $99 advertised in the many product reviews I read about. 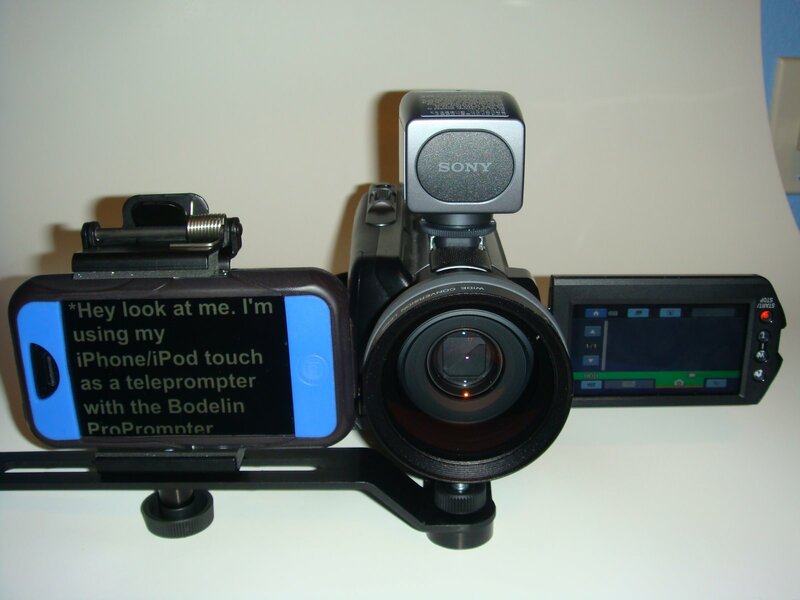 The ProPrompter iPhone/iTouch App was $9.99 ($10.80 with tax) from the iTunes store, again most product reviews said this was going to be free, but being in the software business, I understand there are costs involved even if delivery of goods is electronic. Here are my thoughts on the hardware and software. Here is a picture of the assembled ProPrompter Wing. 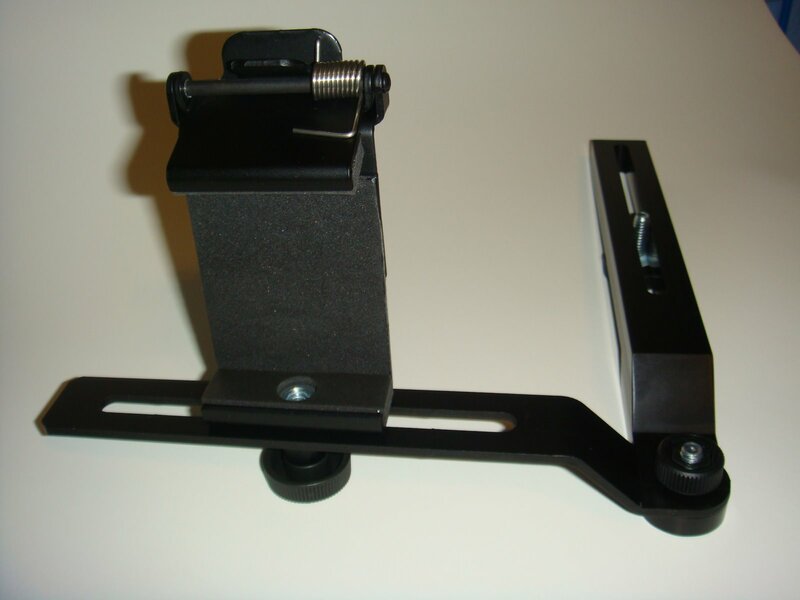 The camera mount part is made from bar stock aluminum and it machined nicely with no rough edges at all, in fact if you strike the middle with your fingernail it will sound like a tuning fork. One of the things I noticed when I screwed the camera mount to the camera is the metal part of the thumbscrew marred the under surface of the camera mount. To fix this I created a small washer out of a plastic milk jug, you can see it on one of the thumbscrews below. The mobile device clip base is made from stamped aluminum which is then bent to the shape you see. 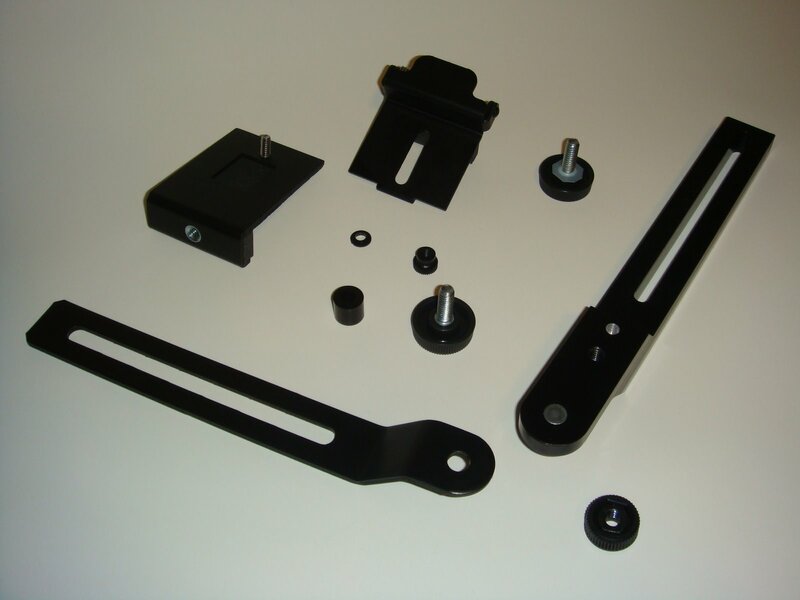 It would have been nice if Bodelin had put the same effort for this mobile device clip base as they did for the the camera mount, there are obvious stamp marks and rough edges, a big contrast in part quality. If you look at the larger version of the pictures notice the inner cutout has several points along the length and is not smooth. This is what the mobile devide clip looks like with my iPhone. The ProPrompter App for the iPhone has a function to put the teleprompter in portrait mode, but unfortunately the mobile device clip, when fully extended, is not long enough to hold the iPhone in portrait mode (even without my iPhone rubber case). Maybe this is a design oversight on Bodelin’s part, who knows, maybe they will fix this in the future. The net here is that I cannot use the iPhone/iTouch software app in portait mode with the ProPrompter Wing. One tip on recording video, since the teleprompter is next to the camera lens there is the chance that people will notice you not looking at them (the camera lens) while reading the script. In order to avoid this, move back away from the camera, maybe 8 to 10 feet. If you are not using a wireless mic or lapel mic, the audio may suffer. Using a wide angle lens will help with this, you can see the one I use on the camera above, as well as, my bluetooth wireless microphone also. This software is easy to use on my iPhone, fairly straightforward, my biggest concern is how Bodelin designed the loading of teleprompter scripts into the app. I cannot type my script into the app on the iPhone/iTouch directly. I cannot take a text script file, add it to iTunes on my computer and sync it to load it in to the app. I MUST use the Bodelin website EVERY TIME I want to load any text/script into the app. 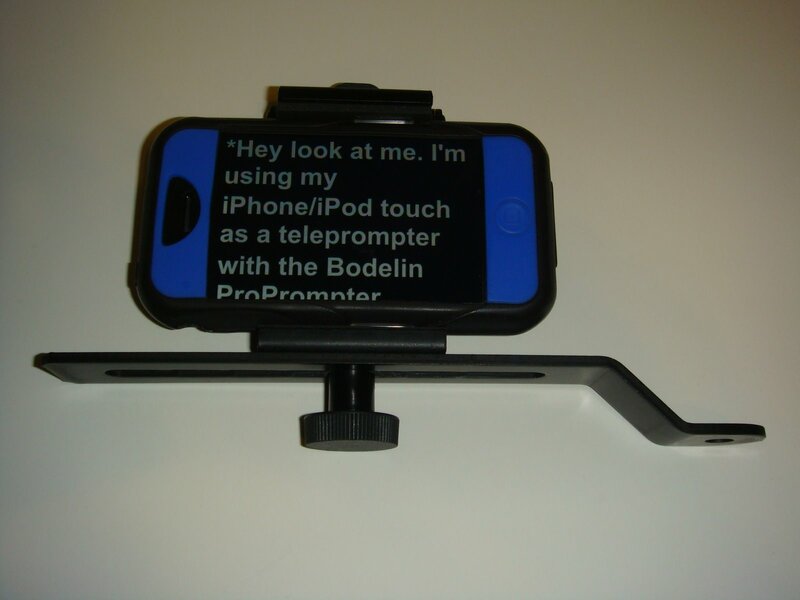 If I want to change my script, I need to do the upload/activate/download teleprompter dance with the Bodelin website. Yes, even if I am in the field, I must have internet connectivity to load a script in the app! So, without constant internet connectivity this software is unusable. With the iPhone this works most of the time since there is a data plan providing basic internet connectivity (unless you are in a area with no cell phone service at all, for me, there are some places I travel where this is the case). With the iTouch, it depends on your connectivity to a wi-fi network. If the Bodelin website went down or is under maintenance, I cannot update my teleprompter scripts. If this software does sell well, I sure hope Bodelin invested in webserver redundancy/loadleveling, backup, and scalability to ensure I can use this product when I need to (this means 24x7x365). Because if they did not, I will be stuck and unhappy, so will others. I’m sure there will be other teleprompter apps in the future to choose from (that don’t depend on a website to load scripts), that’s just how competition works. From a corporate perspective I would be concerned about uploading scripts to the Bodelin website which may contain sensitive or even confidential corporate information. Because once I upload the text, I loose control over the information. Overall I like this product, it is functional, solid, and has practical use for me today and the future. Someday I hope to update to the ProPrompter ProMag for Mobile Devices (or something like it) to get the direct in front of lens teleprompting. Take care & be safe.